The difference between alkaline, or basic, and acidic compounds is whether they dissociate into hydroxide or hydrogen ions in water. The strength of acids and bases is measured on the pH scale, but you can usually tell if a food item is acid, based on its taste. Acidic foods, including oranges, are usually considered sour. You may be concerned about the alkalinity or acidity of foods if you are trying to follow a particular diet. Proponents of a pH-based diet consider oranges an alkalinizing food -- even though the fruit itself is acidic -- because of the residue whole foods purportedly leave in the body. While the pH diet's emphasis on fruits, vegetables and whole grains is commendable, the scientific premise of the diet is questionable. Oranges and other citrus fruits have a low pH due to their citric acid content. 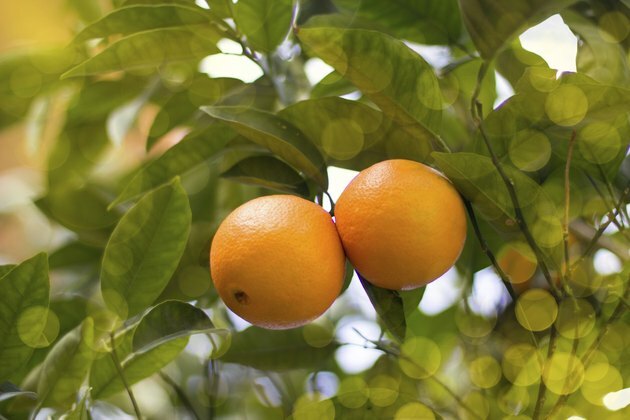 The exact acidity of an orange depends on its variety and ripeness along with the climate, geographical region and conditions in which it was grown. Although oranges are an excellent source of vitamin C, which protects your gums from disease, the acidity of the fruit can wear away the protective covering on your teeth, which is called enamel. To minimize the time your teeth are exposed to acid, eat citrus fruits only during meals. Your mouth makes more saliva while you're eating a meal, which will help neutralize and wash away the acid, according to Delta Dental.